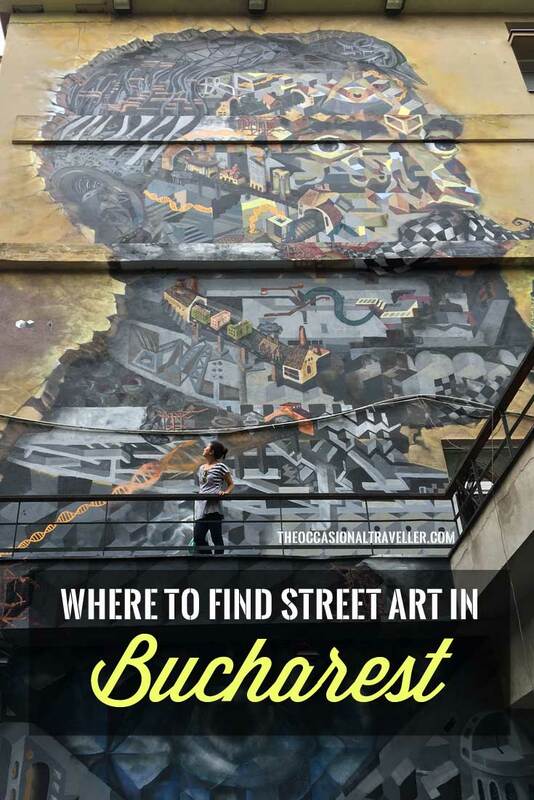 Heading to Bucharest to check out its street art? 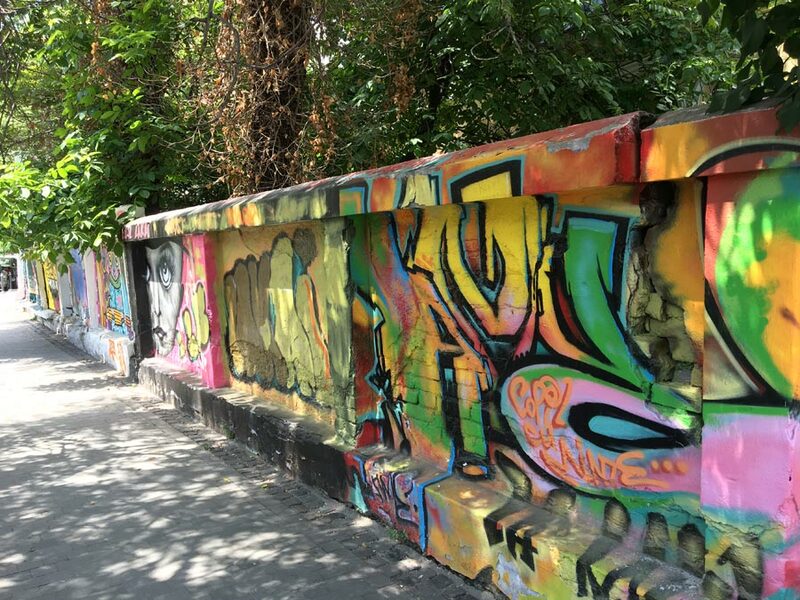 You can find plenty of graffiti in Bucharest – especially in abandoned spots like Chimopar and other rundown buildings in the city. 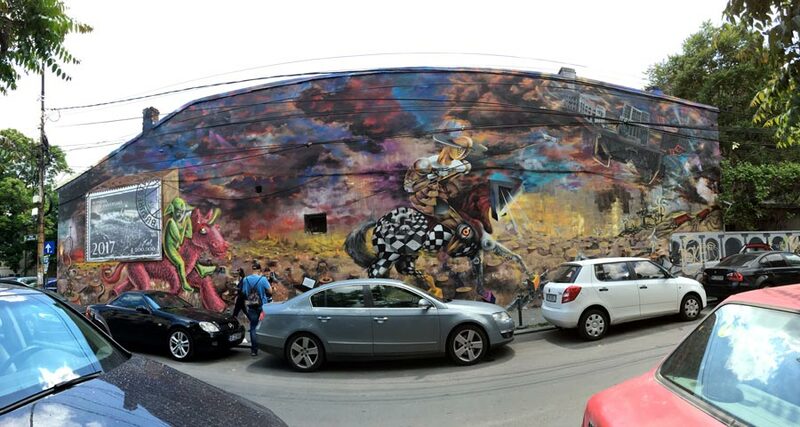 But you can also spot lovely murals… if you know where to look. 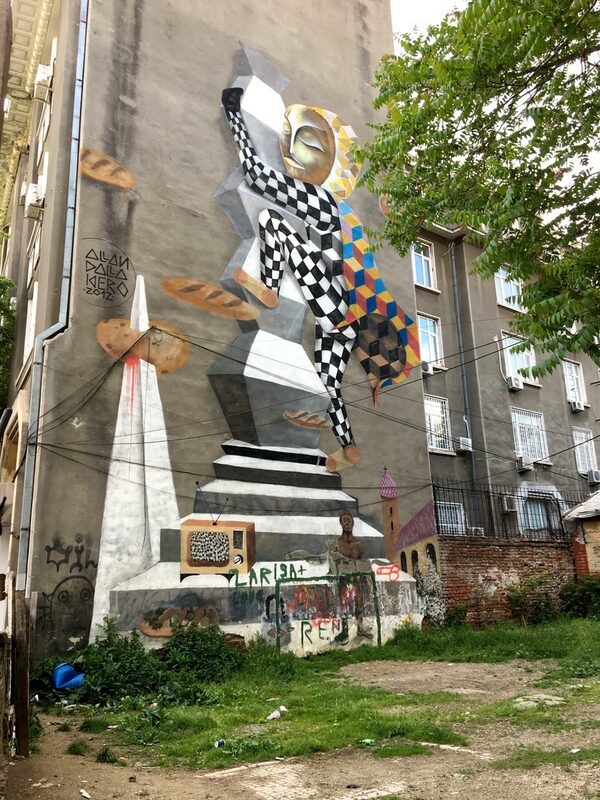 I found street art in Bucharest a bit unusual compared to some of the other cities I’ve found street art in because a number of these murals are located in private property. I usually exclude works on private property because for me, the definition of street art means that it needs to be on the streets and open for the public to see, but in this case I left them in because you can still enter and see these works if you ask security nicely, but just be prepared for rejection or consider taking a tour with the Interesting Times Bureau folk, who I have to thank for pointing out some of these works to me. 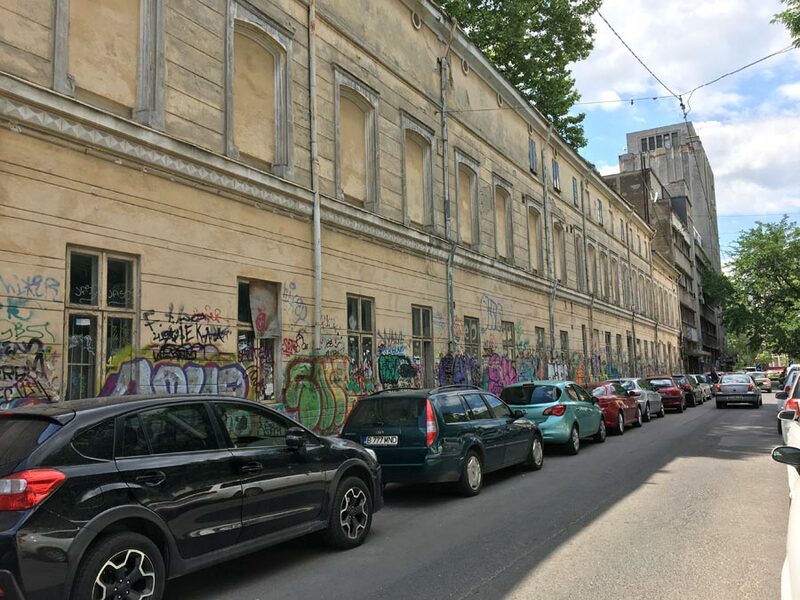 This long stretch of road near Piata Romana is one of the best places to see lots of street art in one area. 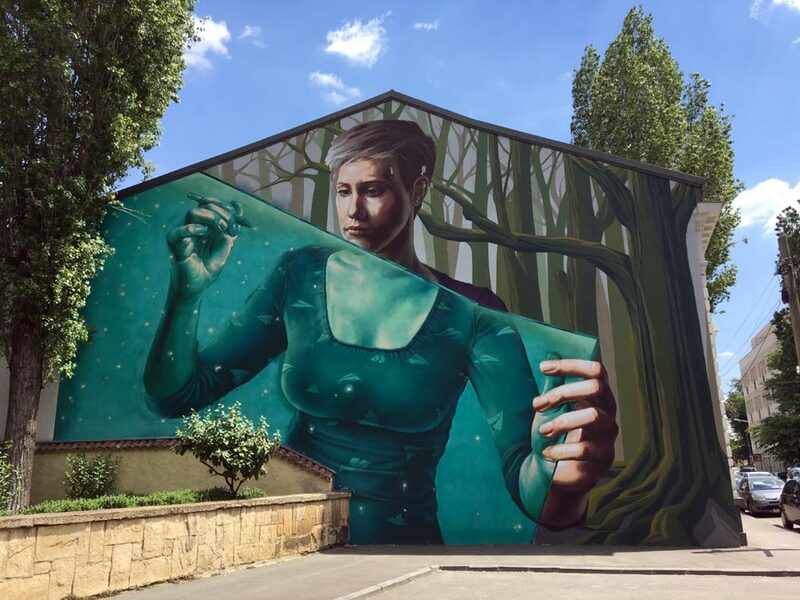 There is one particularly large piece of wall whose works change every year thanks to the annual Street Delivery festival, but you can find lots of smaller artworks lining the lower walls on the opposite side of the street from that big wall and in the surrounding area. 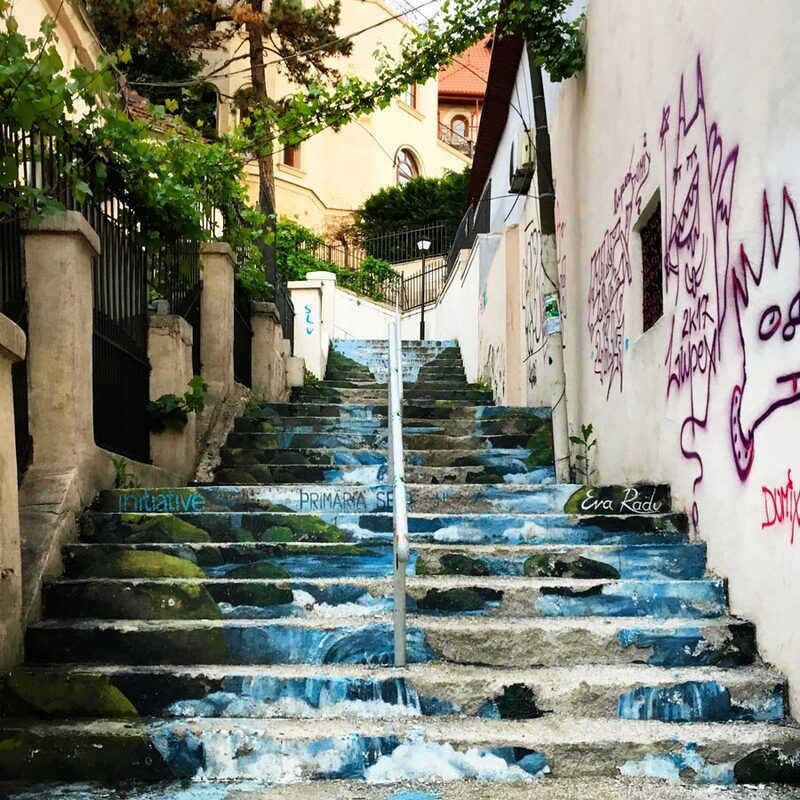 If you only have time for one street art spot, make this the place you check out. Start here at Creart (Piata Alexandru Lahovari 7) at the roundabout – this is private property and you aren’t supposed to enter without permission! I headed next door to ask the security guard for permission and he let me in! The courtyard where the work is is behind the blue and pink doors – be polite and pop next door to ask security for permission, don’t barge into private property on your own! From there, head down Strada George Enescu towards Bulevardul General Gheorghe Magheru, and then walk further till you reach Strada Pictor Arthur Verona. That’s where you’ll find Carturesti Liberia and you’ll see this wall if you look up past the entrance – the artworks here change from time to time. 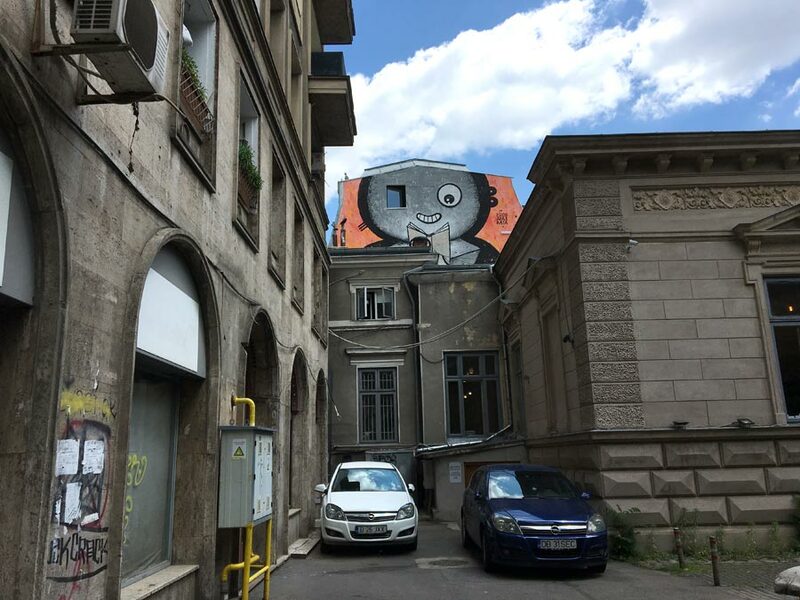 Go around the side of the building to your left and down Strada Pictor Arthur Verona and you’ll see walls on both sides of this narrow street lined with street art, mostly graffiti writing. 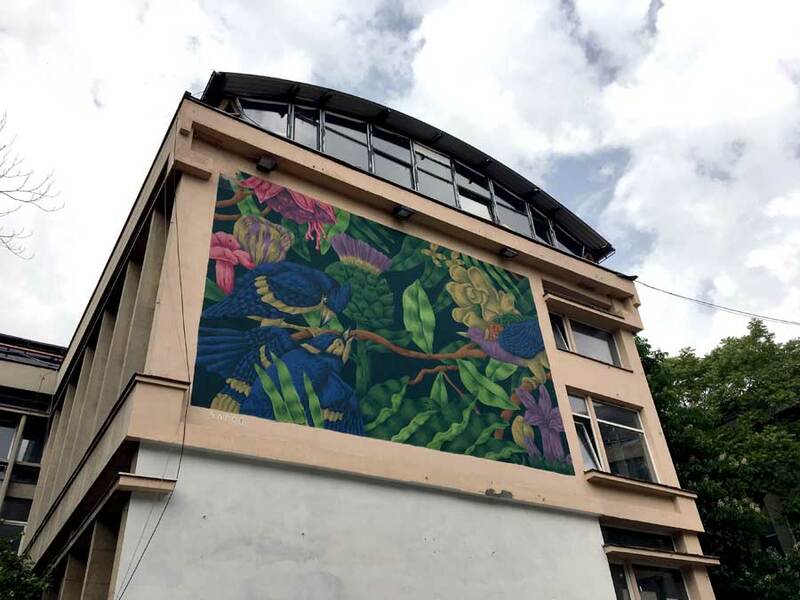 At the junction with Strada Dionisie Lupu, you’ll see this large wall on your right with a huge mural – this changes every year and is usually whoever is headlining the Street Delivery art festival in Bucharest for that year. I took these in May 2017, so it’s probably all changed already! 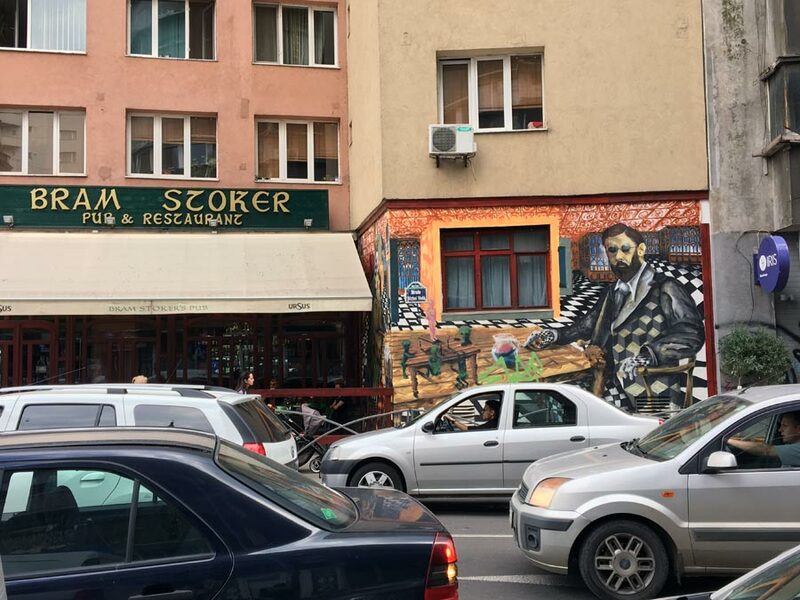 Turn left up Strada Dionisie Lupu and head north – You’ll pass a courtyard restaurant with these murals on the wall at its entrance. 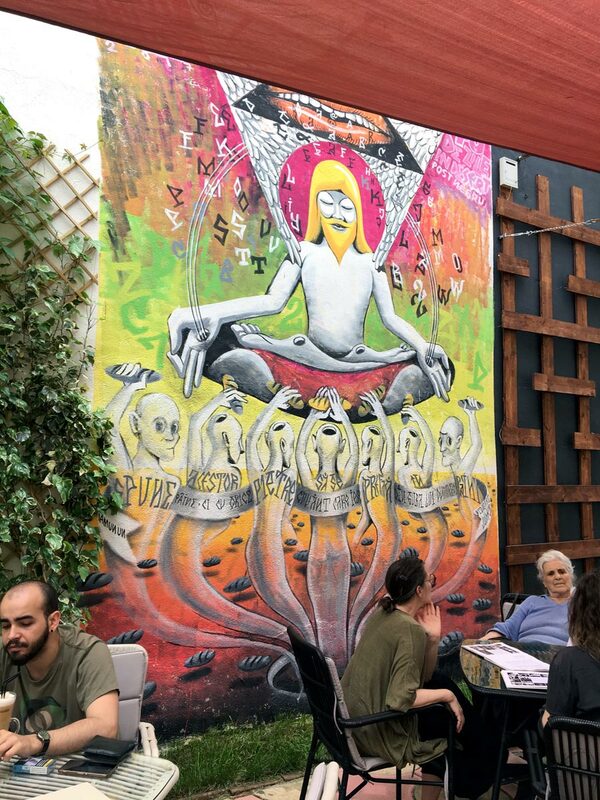 I ate lunch at this restaurant but for the life of me I can’t remember the name of it. This is right next to the Aitch work. Anyone know who this is by? Keep walking till you hit Strada General Eremia Grigorescu and then turn right and head southeast down this road. This work also by Sweet Damage Crew should be on your left. 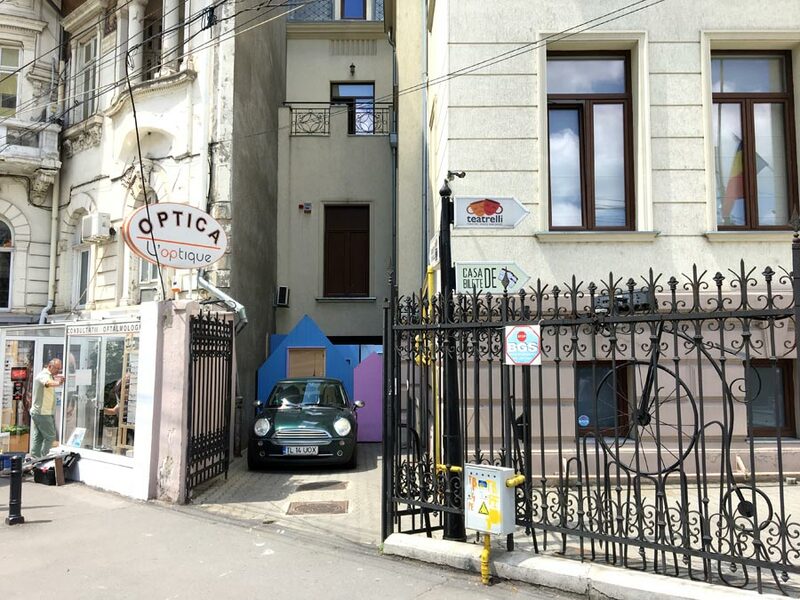 This area is close to Piata Romana metro station – I suggest making a total hipster day of it – after the last work, head back to Strada Polona, and keep walking till you get to Acuarela and Beca’s Kitchen for food and ambience – my Bucharest hipster guide has more about these spots and why you should visit. There are 2 main works that you want to see along this stretch. 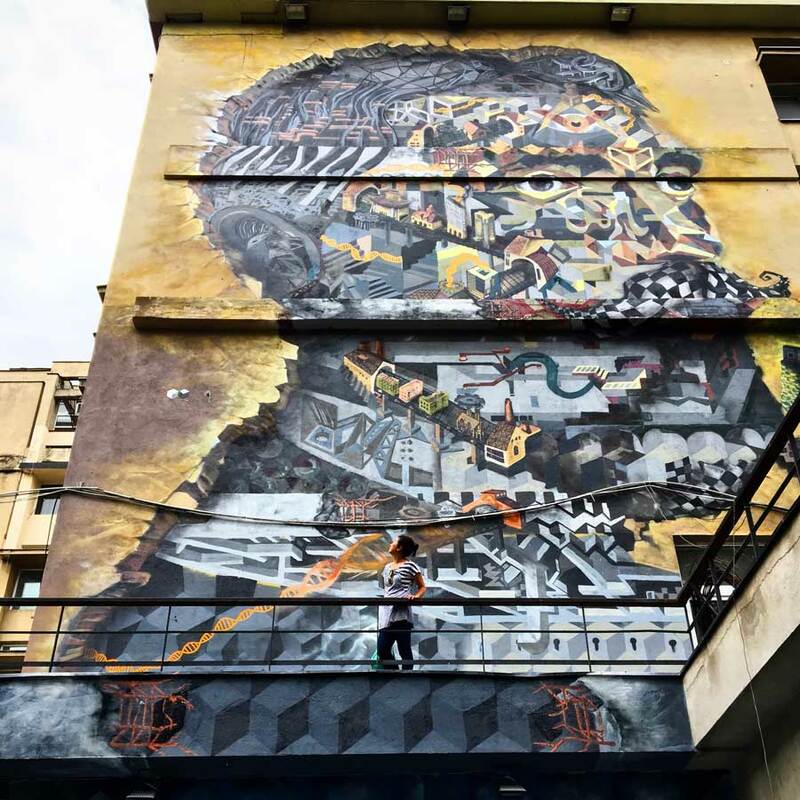 One is Portuguese artist Vhils work. 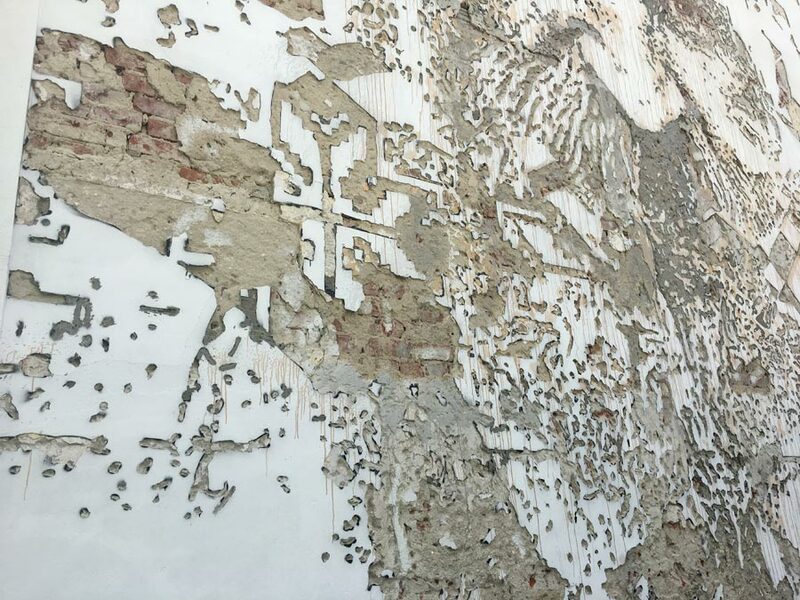 I LOVE his stuff – I caught his exhibition in Belem previously and have also seen his stuff in London, so seeing his work here was pretty exciting! 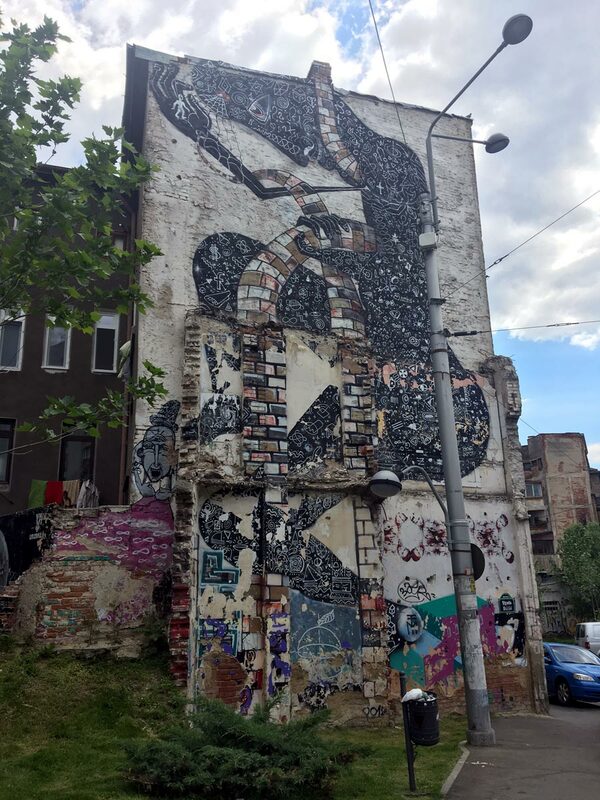 However, we have a semi-private situation happening here – the Vhils work is located in the compound of the Bucharest National University of the Arts (28 Calea Grivitei – but you need to enter by Calea Victorei), specifically on Block C as I’ve marked on the map. I walked in as if I was a student and no one stopped me – but you might want to ask permission from security to enter to be safe. This is a portrait of Constantin Brancusi, a pioneer Romanian sculptor and modern artist, fitting to have in an arts academy! Not seeing the Obie Platon signature was really confusing – I was wondering why the works seemed to similar until I looked it up online! You are in between the metro stations of Gara de Nord and Piata Romana. I’d suggest combining this with Strada Berzei as well but you do need to walk a fair bit! 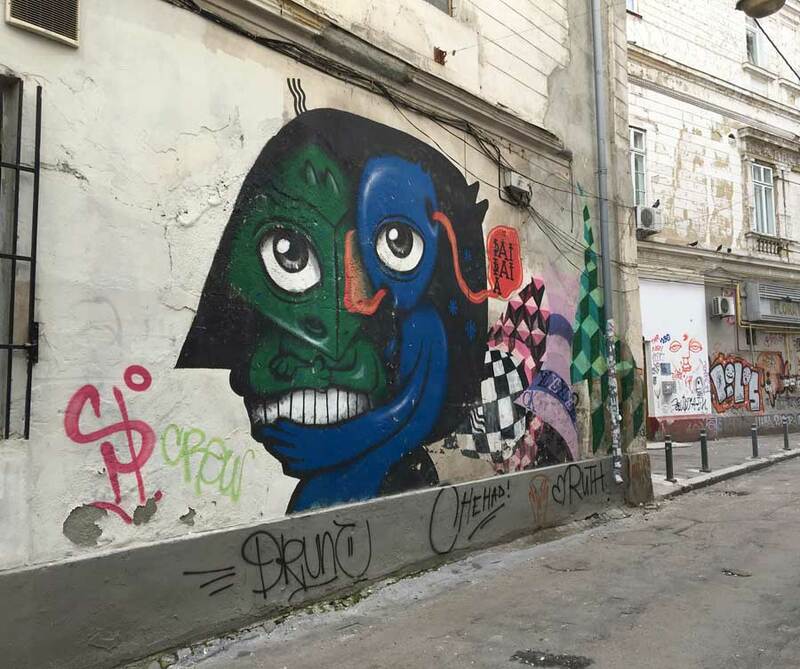 This long stretch of road honestly only has one interesting section for street art – the bit between Strada Stirbei Voda and Strada Grigore Cobalcescu. There’s a whole bunch of older works here but not much else around here. 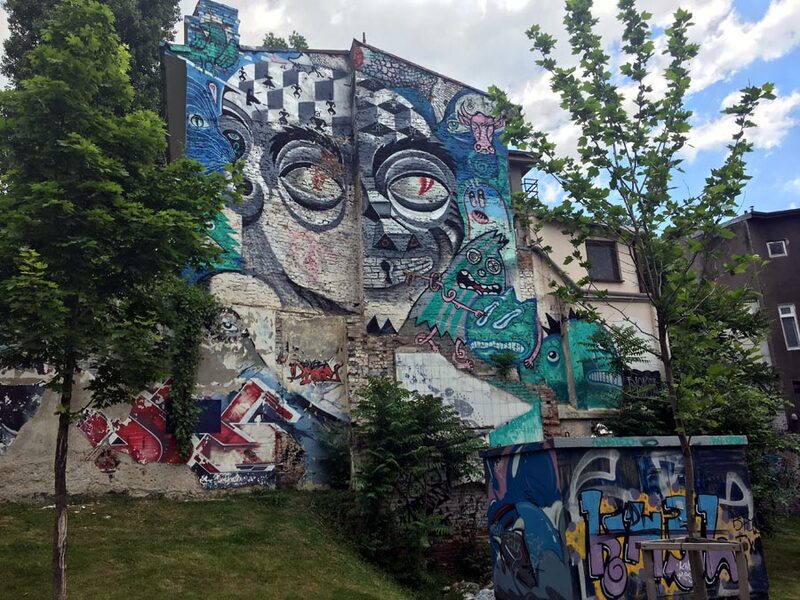 You’ll come to a clearing of sorts at the junction of the two roads where you will see 2 large murals, and other smaller murals and graffiti on the walls of the buildings here. This area is kinda in the middle of nowhere – you’re kinda west of the old town area and between Gara de Nord and Eroilor subway stations. 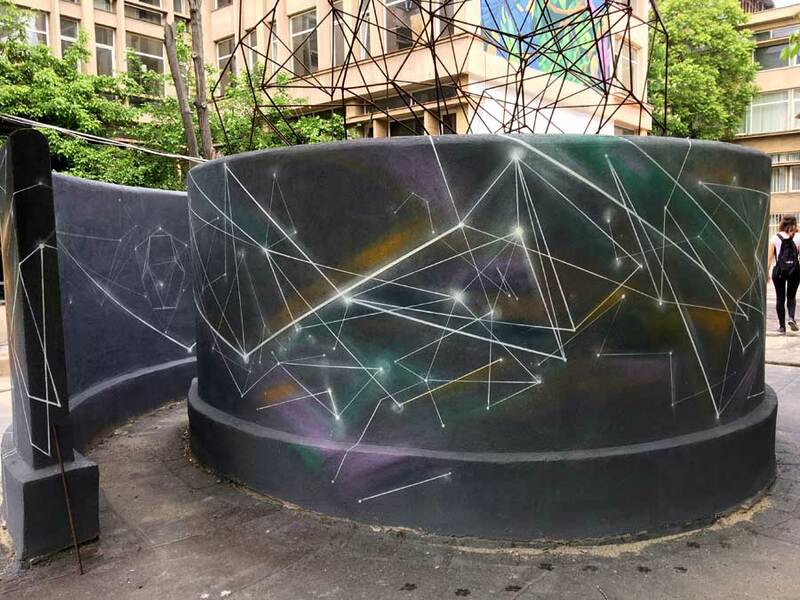 I suggest doing this in conjunction with a walk in Cismisgu Park – head west after you’re done with the greenery for a little dose of urban art! 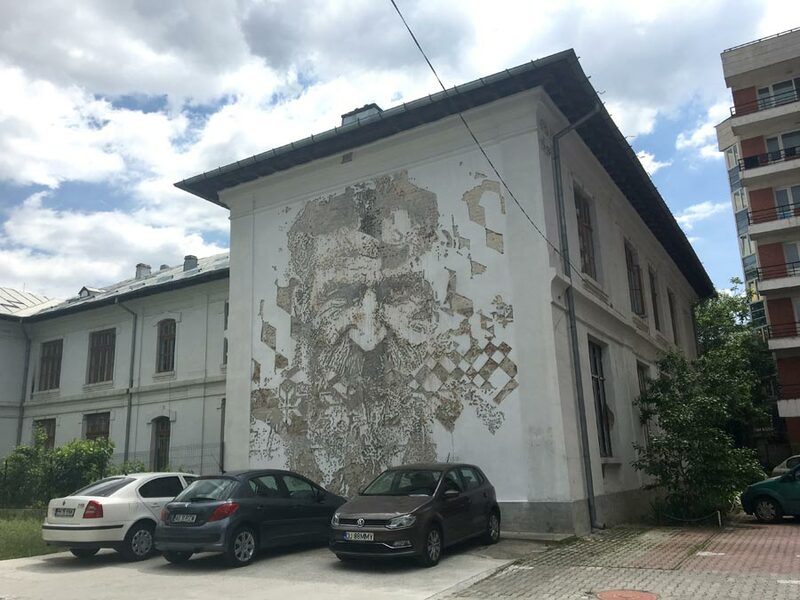 There are some amazing murals but they are located within the compound of the Ion Mincu University of Architecture and Urbanism (18-20 Strada Academiei) – I saw these works because I was on the Interesting Times Bureau’s Beautiful Decay walking tour and we had permission to enter the school compound. You can always try asking security nicely and maybe they’ll let you take a gander at these works! 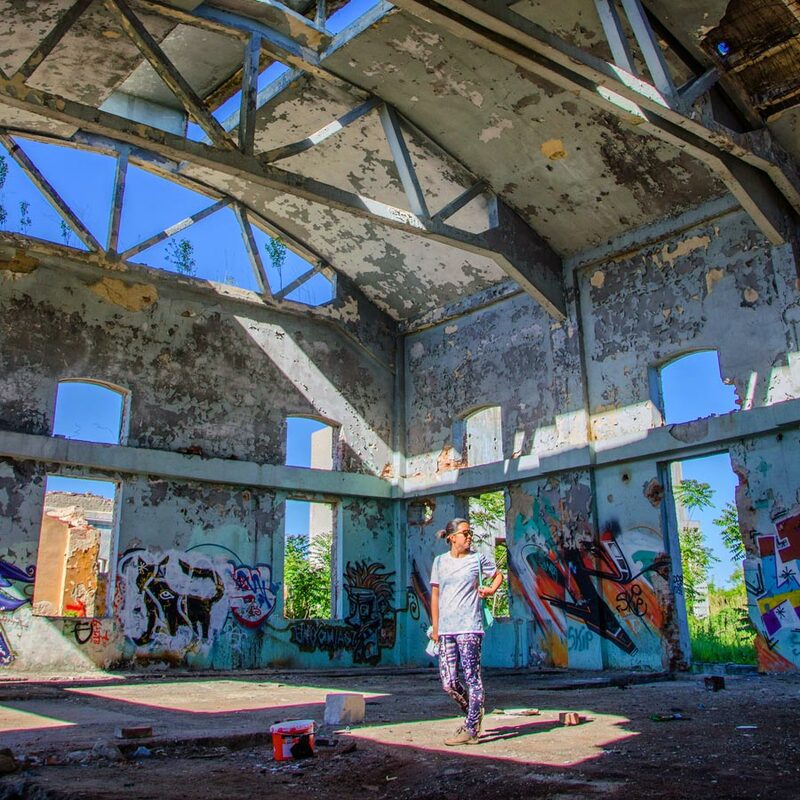 If you like the more typical graffiti and are willing to venture out further, definitely check out Chimopar, the partially abandoned chemical factory turned graffiti haven – read more about that in this post. I stumbled across lots of other works randomly, and some works are pretty isolated, so you can probably check them out if you happen to be in the area, but I wouldn’t necessarily make a special trip out there to see them. Handy dandy Google Map to help you navigate on the go. Let me know if I missed anything, or if any new cool works pop up that I should mark down. 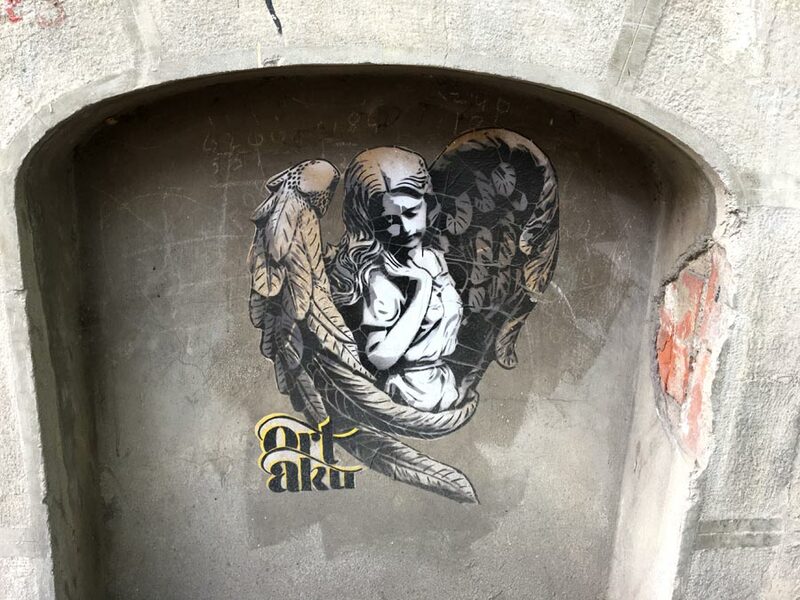 This isn’t super comprehensive – I’m sure there are cool street art works I missed out, feel free to let me know in the comments so everyone else can check them out as well. 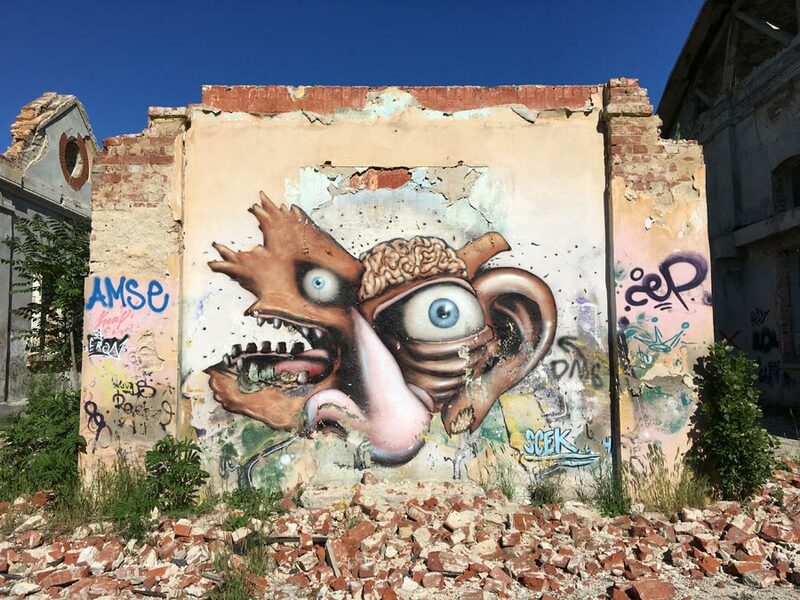 Looking for more street art guides? I have a whole bunch of them for cities from Singapore to San Francisco. Or why not see what else there is to do in Bucharest? 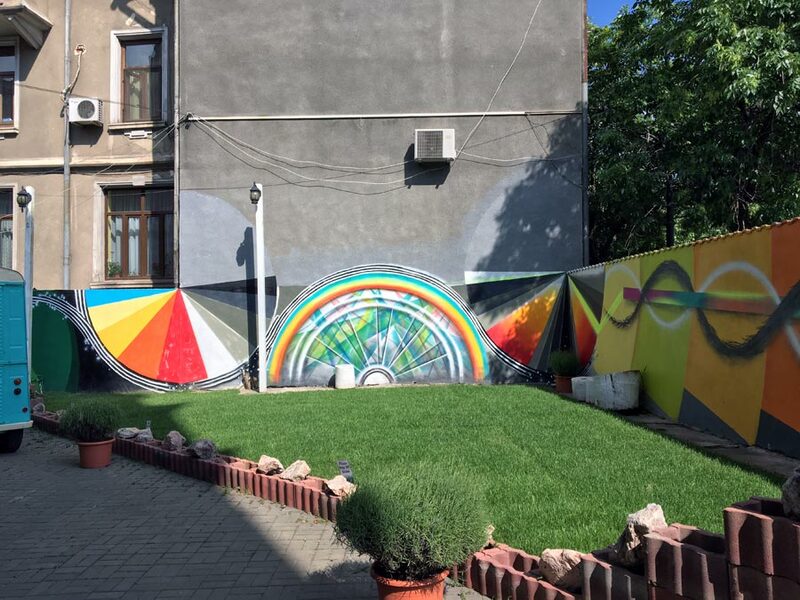 Check out the forgotten spots of Chimopar Factory or the Vacaresti urban delta, or get your hipster on with this guide to cafes and pretty spots in Bucharest. 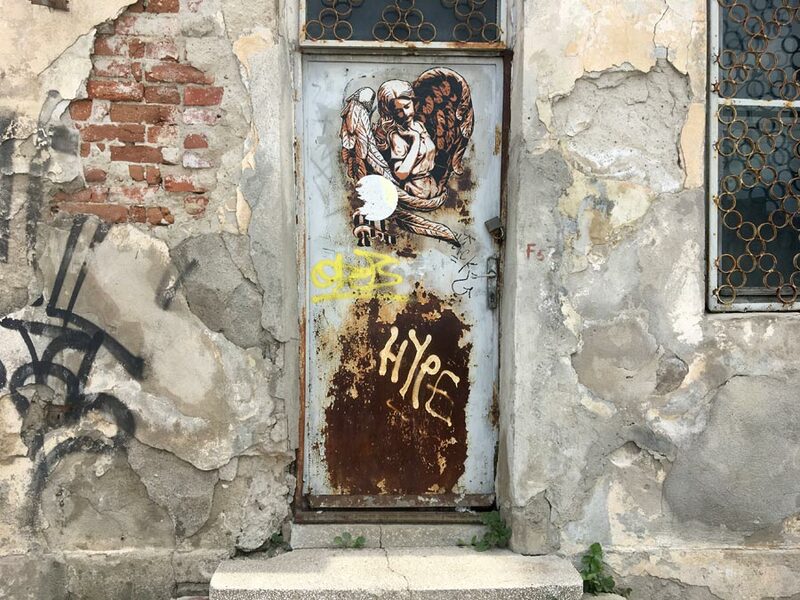 Thanks to Interesting Times / Urban Adventures for organising and sponsoring the Beautiful Decay tour as a part of Experience Bucharest, a tourism project led by the people of Bucharest where bloggers from around the world were invited to check out this beautiful city. Big ups to Constantin who gave me directions to discover some of the works we didn’t manage to cover on the tour, and many of these I stumbled on or did a little bit of googling to find. Wow great map, great resource when I do find my way back to Bucharest eventually! 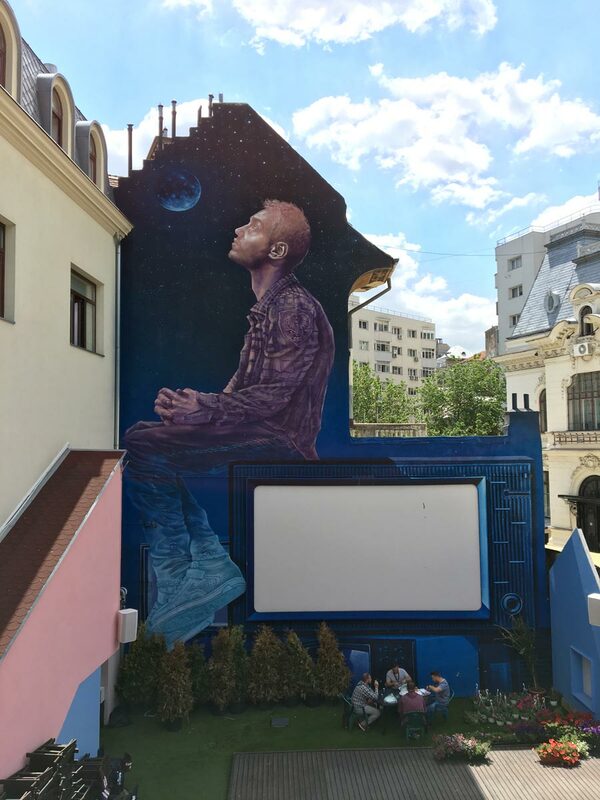 Thanks Jaclynn, we had fun today looking around Strada Arthur Verona, without your article, we would never have known where to start to find street art in Bucharest. To answer your question: right next to the Aitch work is Irlo. And this is the latest installation, a totem by Pisica P?trat? 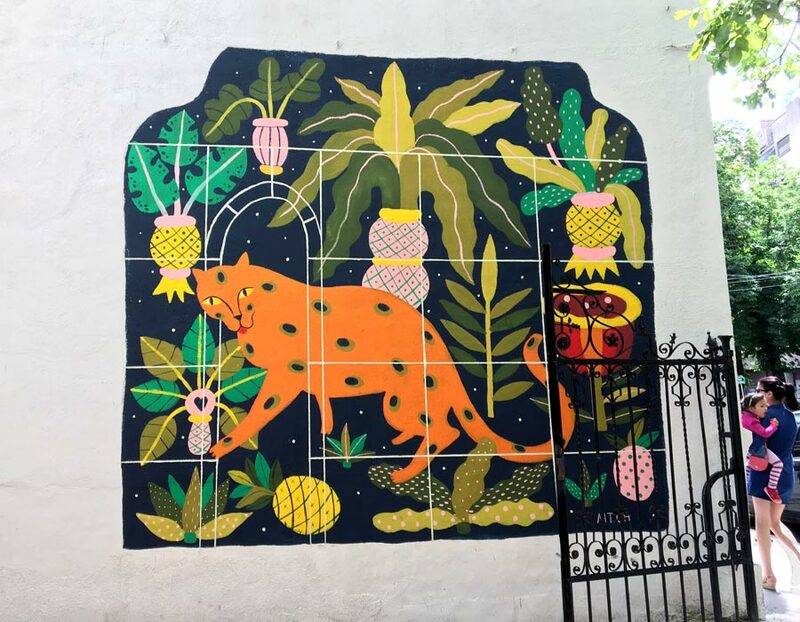 and a screen-printed & painted wall by Sorina Vazelina.